ATBshop turns 18 years old! This years party is going to bigger than ever before with tons going on at the skatepark! Out of stock. Sorry, This item is now Discontinued. Advanced ticket sales are finished now finished, tickets are available in store on the day. So 18 years have flown by since we set up ATBShop back in 2000! We started off in a house running our on-line store from just a bedroom and then moved into number 19 Faringdon road which was just a small lock up shop. We then rented more of the building of number 19 Faringdon road as we grew before moving down the road and into number 9 Faringdon Road - a much bigger 3 story property. I wish people had seen us move the shop that night in borrowed super market trolleys from Morrisons. Yes that building served us well but we out grew it so fast! Then the scooter boom hit and we invested all our money into a big warehouse with a fancy new skate park! It was a massive risk but we knew the people of Swindon deserved a descent skate park. Some how 6 years has flown by since owning the warehouse and we've moved the other shop over so we have two shops now and a skate park inside one building. We've also built a ramp out the back extending the park. So with all of this happening we thought it only fitting to celebrate this massive mile stone and we would love for you to join in! This is an electronic ticket you just need to bring email confirmation or riders name. Members need to bring membership card, Non members under 18 will also need a parent or guardian to sign consent when dropping off. Parents do not need tickets only the riders. So whats happening on the day and what's included in your ticket price for free?! 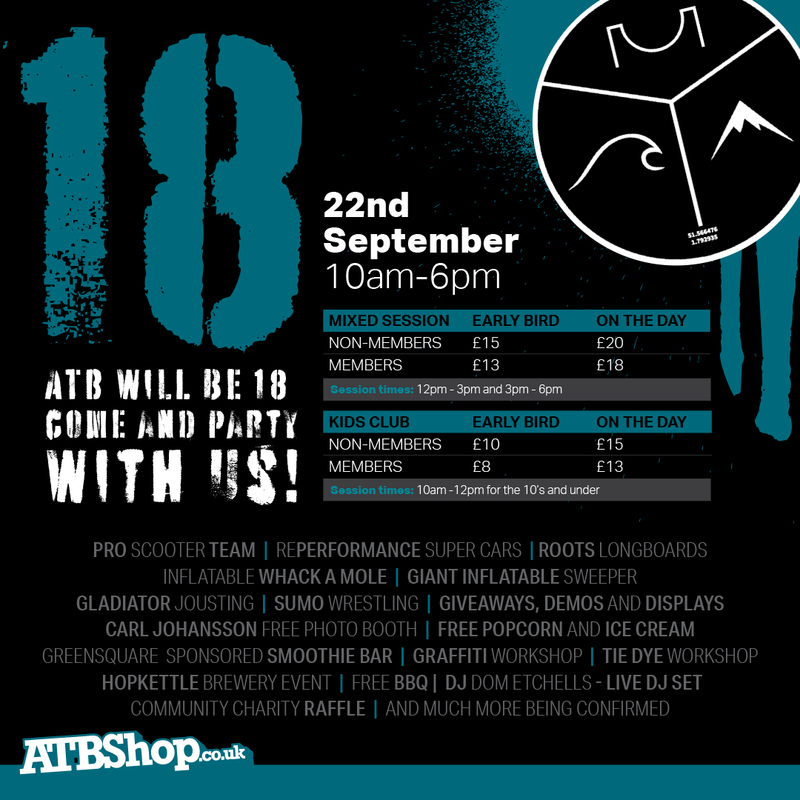 Well on the 22nd of September we will be having a massive party here at the Warehouse starting from 10am until 6pm! First off REPerformance will be coming over with all of the super cars. You'd have seen these guys at the Cody Flom Day back in July! These guys have some amazing cars and will be showing them off during the day! Like last year we will have a free Smoothie Bar. The smoothie bar is a bit DIY with you having to peddle for your smoothie on a bike! So get ready for this one! If you're still feeling active after this one then the Roots Longboard team will be down all day; they've got fun prizes to give away as they run demos and comps all day! We will also have our live DJ playing over the day, as our resident DJ Dom Etchells plays his live set! New for this year is the giant inflatable whack a mole. You've most likely seen this on the internet - we have and that is why its a must for this event thanks to Skys the Limit Inflatables. We've also brought back the giant inflatable sweeper as it was a huge success last year. And if thats not enough then we will have the the gladiator Jousting and Sumo wrestling again. Keeping so of the other cool stuff from last years party - we have bought back Carl Johansson photo booth with free photos. There will also be free BBQ food included in the price as well as fresh warm popcorn - Yum! *Justin and Bens Graffiti Workshop will be back with art to take home made by you. 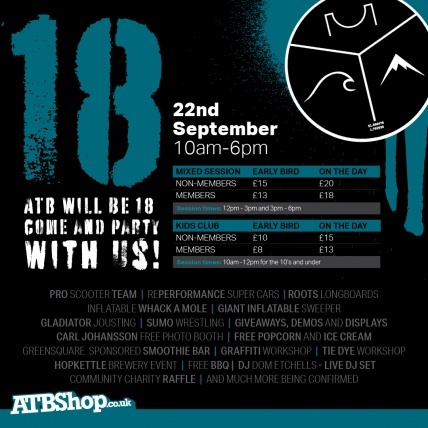 Also we shall be having back our amazing *Tie Dye workshop where you can Tie dye our ATBShop 18th Birthday official tees! *HopKettle Brewery will also be running an event so mums and dads make sure you check out the beers! Community charity *raffle - Make sure you support our chosen charity this year and buy your tickets to be in with a chance of winning hundreds of pounds worth of prizes! Any wording with a "*" is an indication of a possible small fee. There's still tons of stuff being confirmed daily so please keep an eye out for more updates as we hope to have more parts confirmed! If you'd like a ticket then we recommend getting in there early for two reasons. One: Our events often sell out and Two: An early bird ticket will save you ££££!! Here are the ticket prices and sessions so far!